What is the DNA of a place and why is it important? Why is a destination’s DNA relevant to place making, place marketing and destination marketing? Simply stated, a destination’s Place DNA™ is the definition of its intrinsic character, the meaning that people ascribe to it, or more often, a mixture of both elements. In city marketing, we call this AuthentiCity. The DNA definition of your place is the essential authenticity test for all your marketing. For example, if a destination’s Place DNA™ expresses “unique old buildings and heritage landmarks,” it’s best not try to attract people by communicating that it’s “a trendy, übercool place to do business.” A destination’s messaging must match its Place DNA™. Why is this critical to place marketing? A place is much more than a tangible ”thing” or a product meant for consumption. It meets the needs of many types of place consumers, including visitors, residents, companies and brainpower (such as students and academics). While DMOs focus solely on attracting visitors, destination marketers must also be aware of the greater values that define their place as a whole. Destinations are a part of this larger place marketing ecosystem. In addition to meeting the tangible needs of its people, a place also has an abstract value. For example, Paris is known as the “City of Light,” which is one way to express the essence of its DNA beyond the city’s physical environment. Given the different types of value that a place offers, it helps to distinguish between three layers that affect how a place is seen from a consumer’s point of view. Place DNA™ helps us answer the question “Why?” Why would someone live in city X or visit region Y? This reveals a place’s identity and purpose – the attributes that define it, the things that make it tick (or not) and the way it operates from the inside. Place DNA™ consists of a remarkable set of variables: biography, history and geography, a particular attitude of the people, a unique invention, thoughts or traditions, an ambiance, an aesthetic or visual quality, and more. The wine industry calls this sense of place “terroir.” A place’s core identity is at the centre of all the experiences and stories it generates. Moving one layer out from Place DNA™, Place Product asks the question of “How?” How do people experience your place? A place’s product is meaningless without the experience it provides, which relies on myriad factors. How can people interact with the infrastructure and the services available and how is this affected by economics? How can people get there and how can they stay? How can visitors relate to residents and how do residents deal with outsiders? How is the quality of life in the region? Attributes like climate, geography, wildlife, local traditions can also shape the experience for anyone who spends time in a place. The experiences that a place creates will shape the stories told by its residents and visitors. As the outer level of place making, Place Brand helps answer the question of “What?” What makes city X special? What makes this place different from others? What’s in it for me if I visit? The Place Brand is a place’s reputation, which refers to how value is communicated in ways that set the place apart from its competition. Organizations, stakeholders, visitors and residents now have an equal part to play in this messaging and reputation building thanks to digital tools like social media. This involves good storytelling and promotion, which both help express the inner two layers of product and Place DNA™. Why is this so important for destination marketers? As they seek to differentiate from their competitors, place and destination marketers tend to focus on the distinctiveness of their brand instead of their Place DNA™. If consumer perceptions of brand become the primary concern, the place’s core identity risks being forgotten. Instead, the authentic Place DNA™ needs to be seen as the origin of a place’s experiences and product. 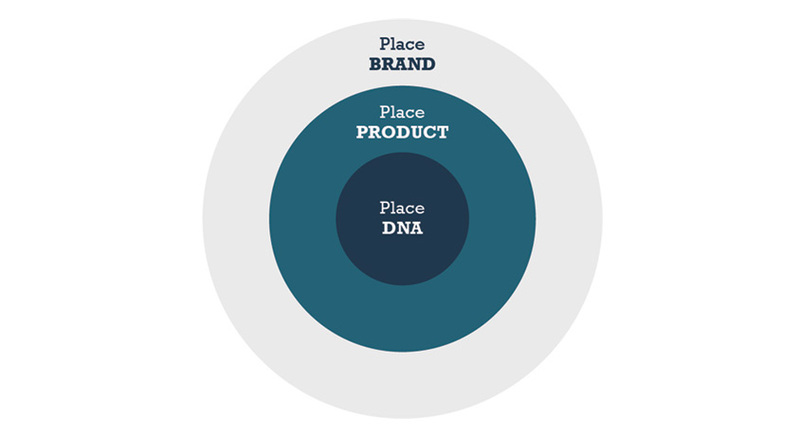 Place marketing without respecting Place DNA™ will become more and more futile. Unlike most brands, places can’t invent their identity based on consumer research. Your place’s identity comes from its DNA. It is this core identity, not the promotion around it, that defines your competitive edge.